Joe is a martial arts fighter and proud Italian American. He was born in Chicago of Sicilian and Barese descent. Joe started taking martial arts in 1977 taking Judo Joe has trained in many styles. He is now training at Shidokan Chicago under Shihan Eddie Yoshimura. Fighting MMA, Pankration and Grappling Tournaments. He has a lifetime of awards. Joe won a Championship Belt at the Naga Midwest Grappling Championships. In 2008 he was the #1 Ranked Director Division Grappler in the Nation. In August of 2009 Joe won 1st place in the expert division at the Naga Europa World Grappling Championship. His lovely wife Heidi is at all his fights cheering him on to victory. Heidi and Adam Kulkuski also help with Joe's training. In August Joe will be inducted into The United States Martial Arts Hall of Fame. 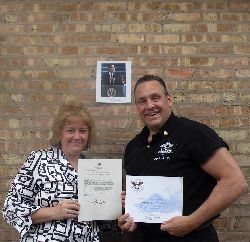 As a Cook County Deputy Sheriff and Shidokan Black Belt he tries to give back to the community. Volunteering to teach self defense to fellow officers and to the cub scouts with Sensei Duane Sharp. Joe was awarded the President's Volunteer Service Award from President Obama. As an officer he was awarded the NRLO Outsanding Officer Award and the Knights of Justice Award. Joe is Proud of his Italian Heritage and is a member of the Italian American Police Association, NIAF and OSIA. Joe was an outstanding football player at Roosevelt High School and the University of Evansville. As a result of his play on the football field he has been inducted into the Roosevelt High School Sports Hall of Fame.